I recently attended a talk at the RIBA in London. 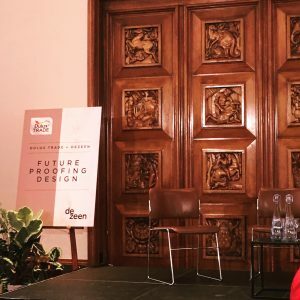 It was chaired by Marcus Fairs, Dezeen founder and editor and the panel members were Louise Tod, Dulux’s senior global colour designer, Mark Dytham MBE, architect, designer and co-founder of KDa and Dara Huang, architect, designer and co-founder of Design Haus Liberty. The event was organised jointly by Dulux and Dezeen and the topic was Future Proofing Design. As somebody who teaches design, I was interested to hear an industry view about the way to create long-lasting architecture and interior spaces for a fast-changing world. It was clear from their discussion that accepting and adapting to constant change is crucial for any industry today and the creative industry is no exception. There were two important questions laid out. Firstly, what timeless design is and secondly, if we should make things to last a long time or knock down and rebuild. It was interesting to hear Mark Dytham talk about the culture and building tradition in Japan, where he is based, which differs vastly from the Western world tradition of preserving old buildings. Since Japan often suffers earthquakes and tsunamis, buildings are destroyed regularly. As they were traditionally built out of wood, they often disappeared in big fires as well. As such, buildings tend not to be valued as much as the land. The life expectancy of the buildings is around 20-30 years only. However, materials are all re-used and nothing goes to waste. Sustainability and longevity were also mentioned by Louise Tod when she talked about paint that is both friendly to the environment and long-lasting. There is also more awareness of the need to re-use old paint and paint pots. Dara Huang talked about changes in the corporate and financial world, particularly the growing awareness of the role of design and creative thinking in designing office spaces. But is any of this really a new concept? 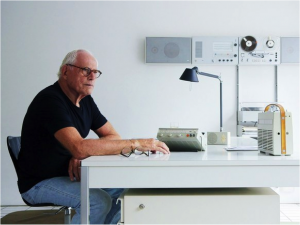 I can think of architects and designers such as Dieter Rams or Frank Lloyd Wright who created timeless architecture and products that we still consider good design. The reason for this is that they achieved the perfect harmony of function and form, which is universally believed to be a definition of good design. The design we consider functional and aesthetically pleasing is timeless because it fulfils our basic human needs. Thinking along these lines and reflecting on what the panellists were saying made me realise what is really new in approach to design today. Firstly, it is the realisation that we should not have any division between creative and non-creative industries. Everything can be done in a creative way for the benefit of end users as well as investors in the projects as design creates value in so many ways. This becomes particularly apparent in office and school designs where productivity and success rates increase significantly when the design of the space is carefully considered. “The existence and life of the environment is felt by the senses. Each aspect of the space influences the mind – the touch of the materials, the sound of the space, the smell of the air; all these work together to form an experience of space. “A real architectural experience is not simply a series of retinal images; a building is encountered – it is approached, confronted, encountered related to one’s body, moved about, utilized as a condition for things” (Pallasma 2006). Throughout human history, there were periods when architecture considered human scale more, and the pleasure of having precious objects of exquisite craftsmanship was a measure of personal success. The difference now is that attention is not so much centred on what we possess but how we use it. This relates to all aspects of our lives as we increasingly talk about quality of life and aiming to experience things rather than accumulate. Applying this way of thinking is probably the best way of all to future proof design. Alberto Perez-Gomez, Juhani Pallasmaa, and Steven Holl. 2006. Questions of Perception-Phenomenology of Architecture. William Stout Publishers, San Francisco, USA .